I've recently wanted to send faxes using my PC for a project. I managed to procure a USB fax modem, but I can't for the life of me find an appropriate driver for it. Driver Installation Failed: Could not find the MODEM device for this driver. So I tried installing everything. 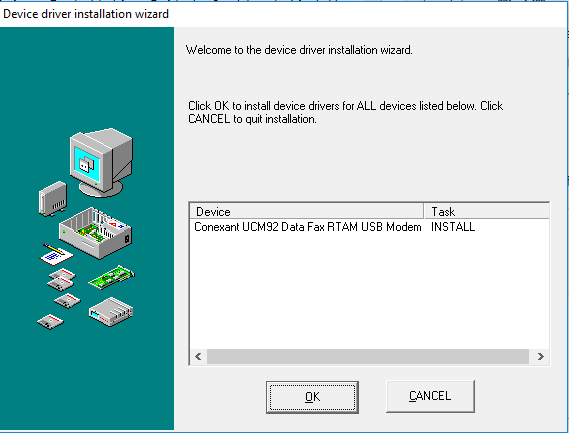 When I tried to install FU07 -> Win98SE, I got a small measure of hope: it actually showed that it managed to find a "Conexant UCM92 Data Fax RTAM USB Modem", As can be seen from this image. But every single time I press OK to install all, when the installation ends the result always ends in Failure. This is similar for literally every other driver found inside this CD. The provided driver package has a SUSBUTyK.inf file which covers the modem. Which mine does NOT have. None of the folders have anything remotely resembling that. I can only deduce that I was sold an incomplete version of the driver. Does anyone know where I can procure a complete version of the driver? Browse other questions tagged drivers usb modem or ask your own question. How to get the correct audio drivers? Does this modem qualify as a fax modem?